Some days ago I decided to jump to Windows 7 Beta on my HP dv9074ea laptop. This is for the main part, my main computer, on which I do most of my work as well as maintaining my music collection, syncing the iPhone etc. Most of the reviews I had read concluded that this is the most reliable and stable beta OS ever, but that it still has bugs and problems that needs to be ironed out, and that using it for everyday use is not for the average user. Well, I do not consider myself the average computer user, and decided to try it out. (what a smart a…) And I have for some days now, so I thought it was about time for me to write up on some of my experiences so far. This is the best experience I have ever had with installing an OS on a computer. It went without any problems whatsoever, and took the shortest time ever. As I stated in a previous post the device manager was almost clean, and installing two x64 vista drivers for my computer solved the remaining issues. The whole process took approximately 30 minutes. My printer is hooked up to the desktop computer at home, and shared over my network. Installing that printer on Win 7 was like a walk in the park. It found the printer, tried to connect to it, asked for permission to download drivers and voila! Up and running. Office 2007 installed without any problems, as should be expected. The only problem I have had so far is the occasional Word crash for no apparent reason. Today I got emailed an older word-document (probably created in Word 97) and this one crashes Word every single time I try to open it. I have no clue as to why this is happening, but MS does not get a pass on this one. Too bad. 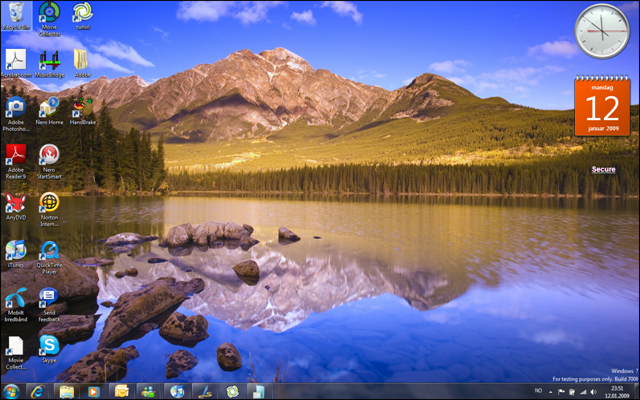 Windows Live Essentials Suite works just great. No problems there whatsoever. After AV software this is the first thing that goes onto my system from now on! AnyDVD 6.5.1.1 works just great the way it is supposed to. No problems there. Handbrake 0.9.3 works great as well. With these two programs I ripped two of my own DVDs last night in order to see them on my iPhone for the flight I took today. Nero 8 installed without any problems, and seems to be running fine on this systems. iTunes … well… the latest version installed just fine (8.0.20.0), but this is the most crash prone application running on my machine. I tried reinstalling, running it in compatibility mode for Vista and then for Win XP SP 2 to no avail. It crashes, and crashes, and crashes. Although there might be a tiny little light at the end of the tunnel; After I removed the compatibility mode (as well as installed Adobe Reader 9 and Adobe Air – although that should not have any impact on iTunes?) it seems to be running better. Only one crash so far (can you hear me laughing? ), and I am keeping my fingers crossed. Adobe Reader 9 works just fine. Adobe Photoshop Elements 6.0 installed without problems and seems to be working just fine as well. It is a little bit early to tell as I have not been using this application much yet. Skype (Beta) 4.0.0.181 installed just fine, and works great so far. When I tried to install the latest official version of Skype, Win 7 warned me of known compatibility problems with this software and offered a link to the Skype (Beta) 4 software download – great! twhirl works just fine as well. I was a little worried in the beginning since none of my friends account pictures showed up, but it turned out fine – it just needed a little time. Movie Collector, the program I use to manage my ever growing DVD collection works without any problems as well. The conclusion for software has to be that most of the software that I use on a daily basis works fine, absolutely fine. My complaint is that the two pieces of software that I use to most; Word 2007 (of choice) and iTunes (because Steve Jobs have decided that i have to!) are the two that so far crashes the most. Which is really annoying. Besides those two applications, Windows 7 is growing on me. While digging around in the software I find little advancements and improvements all the time. Yes, there are slight changes that I personally could have done without, but all in all I am impressed. I have been an avid defender of Windows Vista, which I feel has gotten too much undeserved bad press. Admittedly there were initial problems, but almost all of those have been ironed out now. Windows 7 Beta builds on top of Vista and is an evolution of the OS, not a revolution. MS looks set to have a winner with Windows 7, and I am looking forward to both the Release Candidate and the final version.